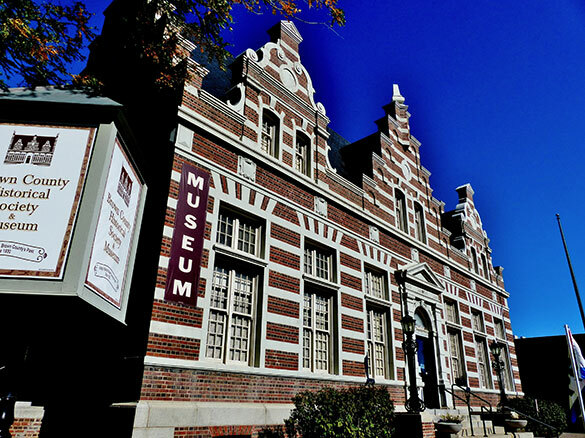 Built in 1910 as the New Ulm Post Office, this brick German Renaissance-style building is on the National Register of Historic Places and is one of the city’s most architecturally distinct structures. Inside, you’ll find an exhibit on the history of the Dakota War of 1862, an expansive historical display of Brown County’s Century Farms, and items from our Sister City of Ulm, Germany, proudly presented in the Ulm Room. The research library attracts over 7,000 users annually and features files on hundreds of families from the county. A gift shop carries many items, including several books on local history. Outside, you can view a map of Brown County’s most historically significant sites and an excellent painting of New Ulm during the Dakota War. New Ulm’s historic Popcorn Wagon will be outside for special events and on many Saturdays during the warm months. This fascinating site is much more than a gorgeous building! Fee: Children - free (ages 4 and under). Students - $4 (ages 5-17). Adults - $7. Household - max of $25 (at least one parent and all their student-age children). Group tours - admission negotiable depending on size of tour - call in advance.